Here is a trio of RT Models Contractor's side tipping wagon previously seen a week of two ago here before painting. The wagons, apart from a little weathering on the wheels are to all intents and purposes complete, and I think looking quite at home on this little Ironstone project I currently have on the go. The yellow load is real Colsterworth iron ore from the South Lincolnshire; and with my toy-train-land-fiction destined for calcination - which is not something suffered by chronic armchair modellers and moaning pontificators, but an industrial process to drive out moisture from iron ore and other such minerals. The main reason for the process is that calcinated ore is much lighter - a significant thing when transporting by rail which charges by weight. 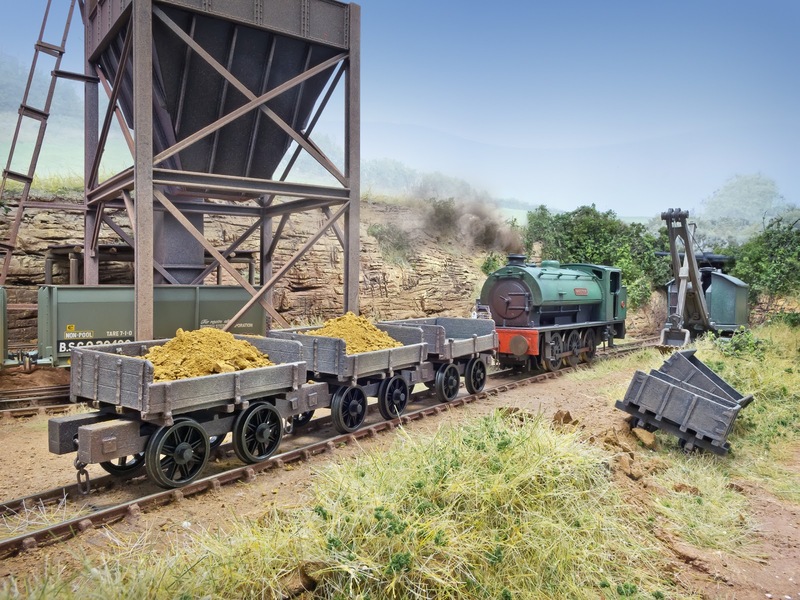 If you want to know more about these wagons - you'll be able to indulge in a full build review in Model Rail magazine shortly.